Now we're in February it surely must be acceptable to say that love is in the air?! Although admittedly there have been Valentines cards in the shops since Christmas, Easter Eggs too - but that's a step too far surely. No matter how you look at it, food and love are inextricably linked. Whether you are looking for ideas or dropping hints or simply love good food I've got a selection of luxury food and drink goodies that would be perfect for sharing with a loved one or indulging in alone Bridget Jones stylee come 14th February. It's no secret that the love of my life is Gin so it's only proper that I offer some Valentine Ginspiration. In the spirit of recycling I give my husband the same Valentine card every year. It says "I love you more than Gin and Tonic". The jury is still out on the validity of this statement. There's an abundance of choice out there for the discerning Juniper connoisseur so without further ado here's my seasonal pick if you are shopping for the Gin lover in your life. If the Gin lover is you, do feel free to forward a link to the significant other in your life. I find a direct approach works much better than subtle hints. Sipsmith was the first copper distillery in London for nearly 200 years and was really the start of the UK's gin revival. 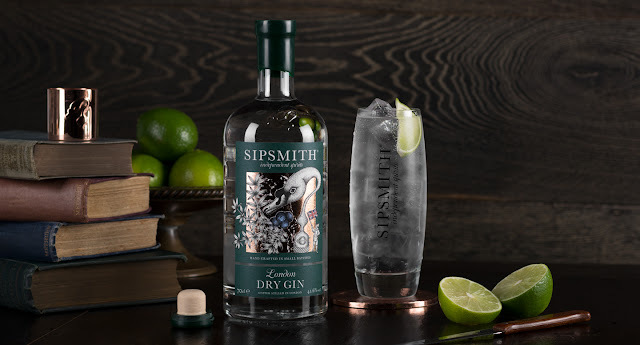 Every bottle of Sipsmith is hand-crafted in genuinely small batches in either Prudence, Constance or Patience (the three copper pot stills) Prudence has a swan neck hence the logo. Ever since I spotted their Lemon Drizzle variant popping up on social media I've been desperate to try it and it didn't disappoint. Gin + Cake is truly a winning combination. 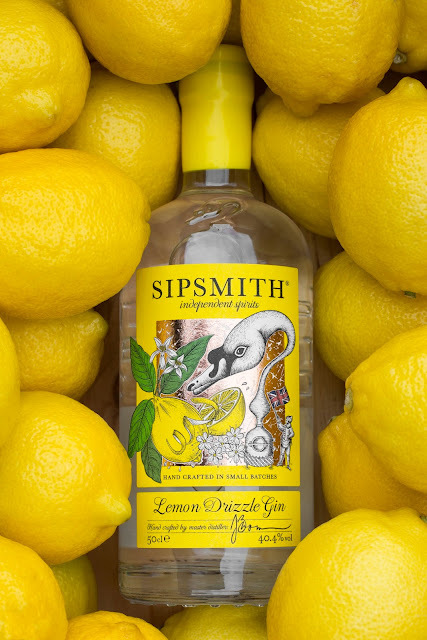 The Lemon Drizzle is made with a London Dry backbone and then the Sipsmith team painstakingly peel hundreds of fresh lemons for each batch. It's a labour of love that is most definitely worth it. 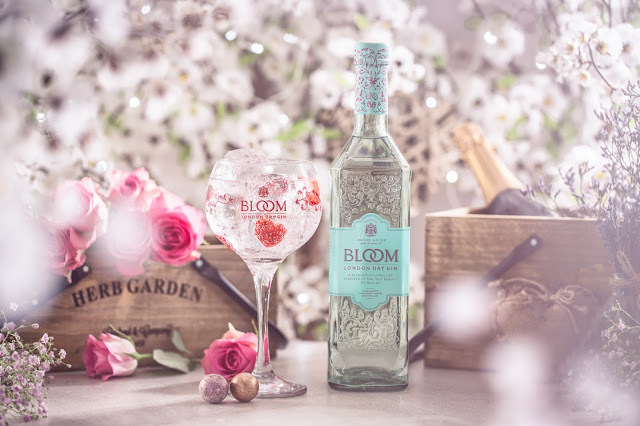 BLOOM Gin, with it's stunning eau de nil floral bottle and pretty heart gift tag, is the perfect gift for a gin lover who loves a floral, delicate gin. Dare I say it, perhaps one for the ladies. It's distilled by one of the world's few female Master Distillers, Joanne Moore. Now there's a job I'd like to have! They kept that one quiet in the careers guidance talk at school. Joanne chose the flowers of chamomile and honeysuckle, with the citrus fruit pomelo to make up the three main botanicals for BLOOM. It's beautiful new bottle and delicious floral flavour appeals to non-gin drinkers and gin aficionados alike. The heart gift tag gives the recipe for two easy cocktails: BLOOM & Tonic and French 75 which will be a sure hit on Valentine's Day. Why give flowers in a bouquet when you can give them in a bottle of Gin? 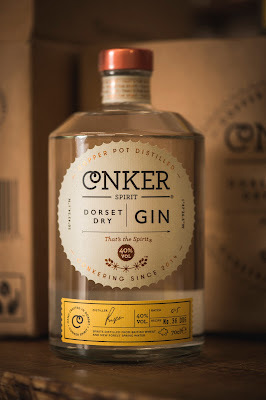 Conker Spirit Dorset Dry Gin is a home-grown dry gin courtesy of Dorset’s first gin distillery. It would make a superb addition to any drink collection or the perfect gift for your loved one this Valentine’s Day. I first discovered it back in September 2015 when I was in Dorset visiting River Cottage. I was taken by both its stunning good looks and its coastal flavours. Each bottle is hand-signed and made in batches of 60 at a time – giving it an extra special touch. 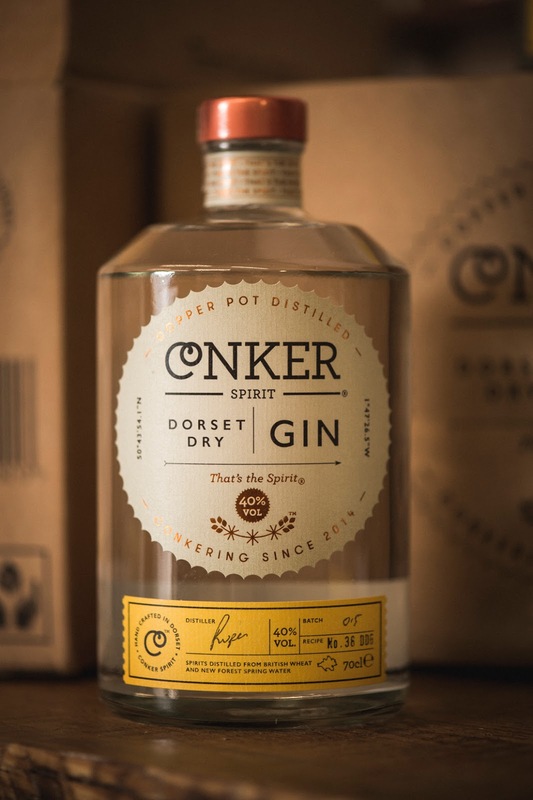 The distillery is nestled in the sandy backstreets of Bournemouth and the Gin is defined by the fresh Dorset notes of marsh samphire, elderberries and handpicked New Forest gorse flowers. Prosecco really has become the fizz of choice with an 80% rise in the sales of sparkling wine in the last 5 years we just can't get enough of it. Less expensive than Champagne it can be enjoyed as an aperitif, with meals and is perfect for celebrations. For Valentine's day why not pimp your bubbles pink with the addition of a liqueur to create a Royale. Chase your valentine round the Mulberry bush for this colourful tipple. Traditional sloe gin – a product long steeped in British tradition – serves as the primary inspiration behind Boodles Mulberry. Made with mulberries, a touch of raspberries, Gin and a blend of natural ingredients, Boodles Mulberry is a liqueur perfect for sipping both warm and cold. 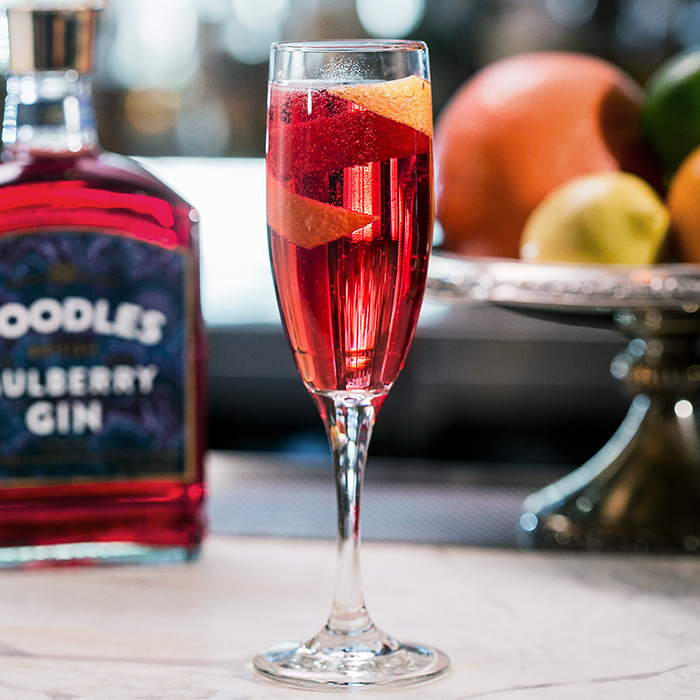 For Valentines Fizz make a Boodles Royale with 1 Part Boodles Mulberry Gin to 3 Parts Prosecco or Champagne. Garnish with Lemon twist and serve in a champagne flute. Flamingos are pink, violets are blue and Chambord is a black raspberry liqueur perfect for you! 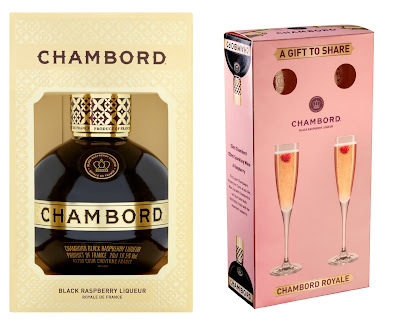 Chambord is a luxurious French black raspberry liqueur, with intense raspberry and vanilla notes, which is perfect to enjoy with Champagne or Prosecco as a Chambord Royale. The iconic bottle reflects the legend that Chambord was inspired by a luxurious raspberry liqueur produced for King Louis XIV during his visit to Chateau Chambord in the 17th Century. 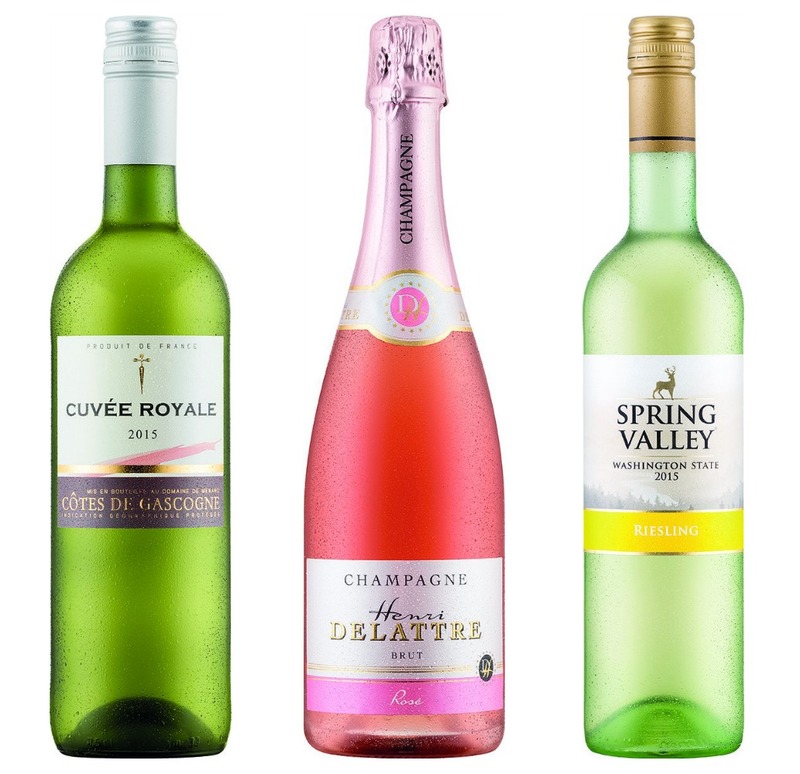 Champagne is the quintessential romantic drink and at at only £14.99 you can definitely afford to splash out on a bottle of Henri Dellatre Rosé Champagne from Lidl UK. 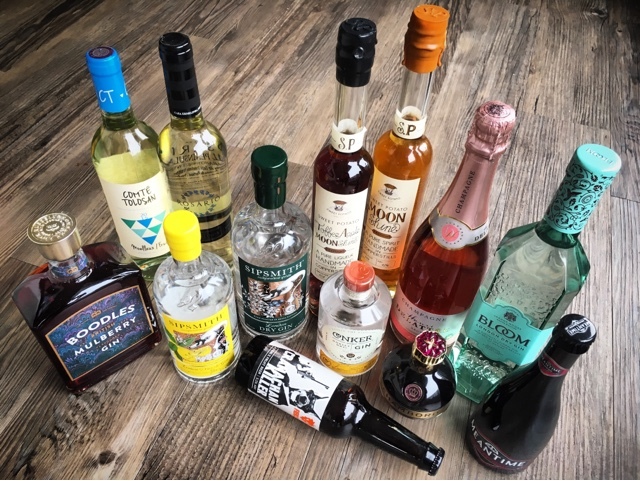 Ideal for those planning on celebrating the occasion at home or simply looking for a pre-dinner tipple to enjoy before heading out for the evening. Rose Champagne has become increasingly popular in recent years, this is an elegant, smooth example, not too highly flavoured and very easy to drink - Cheers! The Henri Dellatre Rosé Champagne is just one of 39 bottles in Lidl’s latest Wine Cellar Collection, which also includes a selection of lower alcohol wines (meaning you don’t have to break the diet or bank this Valentine’s!) The limited edition range hit shelves on the 26th January, and will be in stores until stocks last. Hand brewed in Aberdeen just up the road from me, Fierce Beer have made a real impression in a short space of time with a range of bold, strong flavours across Pale Ales, Fruit Beers and Dark Porters. Local, natural and a wee bit quirky are the keywords with flavours ranging from peanuts and coffee to honey and chilli. The two latest additions to the range are Tropical Tart and Easy Shift. Fierce beers are currently available in craft beer shops across the UK, as well as some Spar and Oddbins shops in Scotland. Based on a pale, lightly hopped wheat beer, the refreshingly crisp fruitiness, aroma and rich colour of Raspberry Wheat comes from the addition of fresh raspberry puree during maturation. Balancing tartness with sweetness, on its own this brew is a delicious Valentines aperitif to share with your loved one, as well being as a great partner for goat’s cheese, rich pate or anything chocolatey! 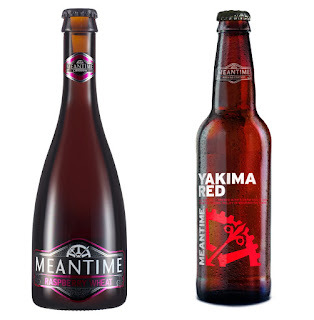 Meantime’s Yakima Red is brewed with British and German malts and boasts a deep ruby colour and medium to full body. Cooking up a storm for your loved one this Valentines? 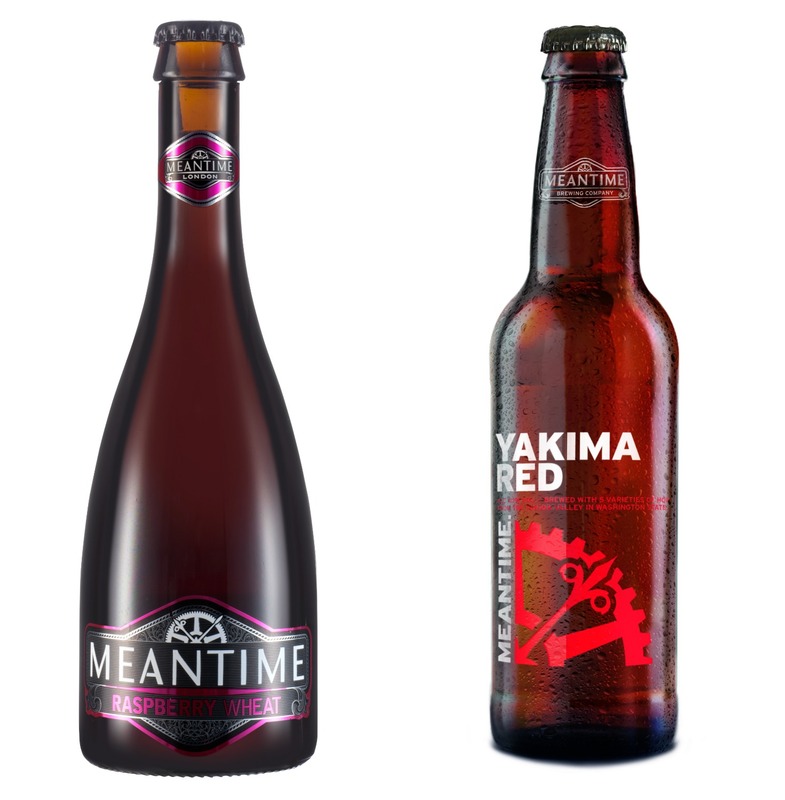 Meantime Yakima Red is a wonderful match for veal, crispy roast pork, ham hock or charcuterie. 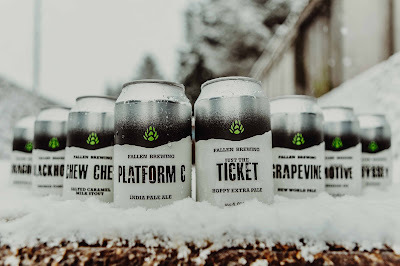 Fallen Brewing, one of Scotland’s leading craft breweries, has just become one of the first breweries in Scotland to install a canning line and move its entire beer range into cans. Established in 2014, Fallen Brewing is situated in the old Kippen Railway Station with views towards The Trossachs and The South West Highlands. The range is made using only pure, soft Scottish mountain water and the best hops and malts from around the world. 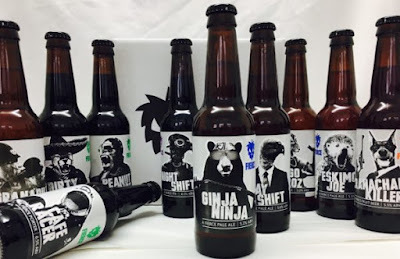 RRP from £2.10 for 330ml from independent shops including The Woodhouse Farm Shop, Cork and Cask, Cornelius and Beer Hive in Edinburgh and Hippo Beers, Good Spirit Company and Valhalla’s Goat in Glasgow. Welcome to the world where twin passions of sweet potatoes and artisan distilling are mixed daily. I am both smitten with the name and the concept. If you thought Sweet Potato Fries were awesome you ain't tasted nothing yet. 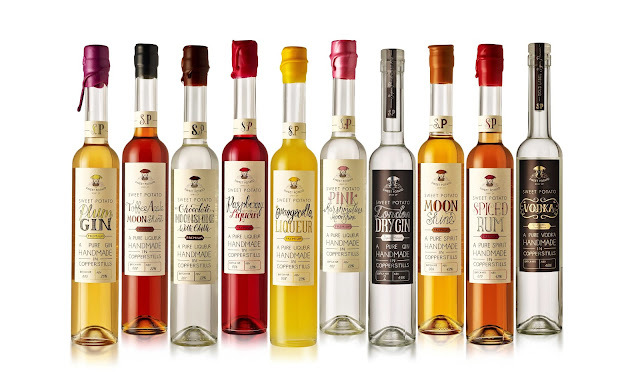 Each sweet potato spirit is hand crafted using specially selected, raw ingredients and distilled three times in copper pot alembic stills, using methods passed down over years. Oh so stylish 50c bottles and wonderful flavours. The core range are as below but I also tried out Toffee Apple Moonshine which is a new addition to the lineup along with Plum Gin, Chocolate and Chilli Moonshine and Pink Marshmallow Moonshine. Moonshine The UK's first Sweet Potato Moonshine bolsters a heady mix of vanilla, warm peach and apricot skins with a smack of golden caramel to finish. Spiced Rum Dive into waves of ginger, treacle and lemon blossom coming up for air only to be enveloped by cherry, peach and warm spices with a tap of cracked-caramel to finish. Raspberry Liqueur The sharpness of raspberries and the perfume of violet petals gives way to a light fruit sugar rush with a long and refreshingly gentle acid hit to finish. Orangecello Liqueur A choice for the friskier liqueur lover, pair Orangecello with champagne for a Sweet Mimosa. Why not say it with sausages this Valentine's day?! 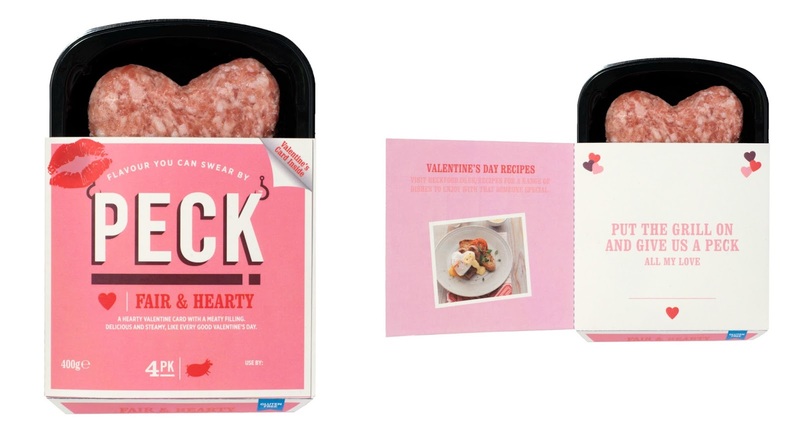 HECK have created a Valentine's Day card with built in breakfast. Go the whole hog with four heart shaped 97% British pork patties. This delicious declaration of love is available exclusively from Waitrose. Perfect for a hearty breakfast. What could be sweeter than Honey for your Honey? Cut straight from the hive with nothing added and nothing removed. 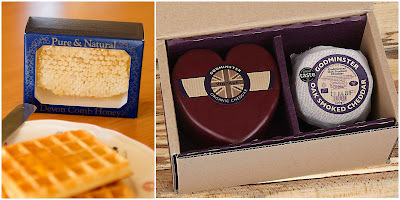 Produced by a family run farm in Exmoor, Devon this pure and natural honeycomb would be the perfect addition to any Valentine's Day Breakfast in Bed. If you thought that a heart shaped sausage was cheesy then you ain't seen nothing yet! 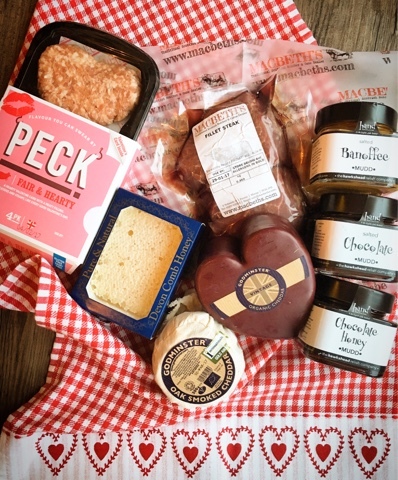 This utterly delicious Godminster Cheese Duo Heart Box Set is made in the heart of rural Somerset at Godminster Farm. Happy cows provide the milk for the signature cheddars, which have been in production for over 70 years. This lovely set of two cheeses contains a full-bodied 400g Cheddar sealed in Godminster's signature burgundy wax in a charming heart shape. Alongside is a rich and smooth 200g round oak-smoked Cheddar, smoked with sustainable chippings. Where you choose to spread your MUDD this Valentines day is entirely up to you... I've been spreading the Salted Banoffee on Broiche Rolls and it's rather wonderful. Salted Banoffee Mudd – Fresh Bananas are combined with double cream with an added twist of Anglesey Sea Salt together creating a flavour extravaganza. Love me Tender on Valentines Day with a prime Scotch Beef steak from Macbeth's. Available online via mail order throughout the UK Macbeth's is a traditional Scottish Butcher & Game Dealer based in Forres, Morayshire. All their beef comes from the family farm, Edinvale in Dallas from the traditional native breeds of Highland, Shorthorn and Aberdeen Angus cattle. 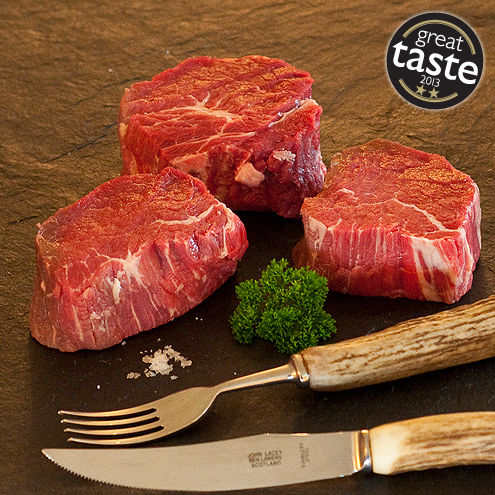 Grass fed the award winning well hung beef steaks are aged for a minimum of 21 days. The Guild of Fine Food Great Taste Awards dished out a gold star awards to their sirloin and rump steaks whilst their rib eye steak was awarded 2 gold stars. Whichever cut you choose you'll find that Macbeth's steaks are full of flavour and wonderfully tender. A real luxury product that will make the perfect romantic candlelit dinner à deux. Disclosure : Thanks to all the brands and PR's who provided products for review. All views expressed are my own. 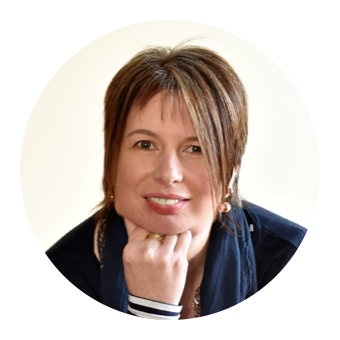 I’m super choosy who I work with and promise to only ever bring you the cream of the crop. I do hope your true love thought you were a "Sweet Potato"
What a lovely lot of goodies - great guide! I'd take pretty much any of them over chocolates and flowers! What a fantastic thoroughly written guide for this Valentine. Might enjoy a couple of them from this list. I do hope that your significant other chose wisely from the list.